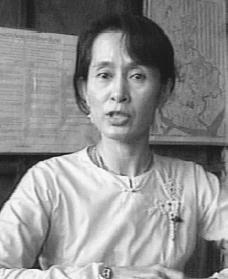 I n 1988 Aung San Suu Kyi became the major leader of the movement toward the reestablishment of democracy in Burma (now Myanmar). In 1991, while under house arrest by the government for her activities, she was awarded the Nobel Peace Prize. Aung San Suu Kyi was born in Rangoon, Burma, on June 19, 1945, the youngest of three children of Bogyoke (Generalissimo) Aung San and Daw Khin Kyi. (In Burma all names are individual and people do not have last names.) Her father is known as the founder of independent Burma in 1948 and is beloved in that country. He played a major role in helping Burma win independence from the British, and he was able to win the respect of different ethnic groups through the force of his personality and the trust he inspired. Her mother had been active in women's political groups before marrying Aung San, and the couple often hosted political gatherings in their home, even after the births of their children. In July 1947 Aung San, along with most of his cabinet, was assassinated by members of an opposing political group. He never saw his country become independent on January 4, 1948. Aung San Suu Kyi spent her early years in Burma. She later joined her mother, who was appointed as Burmese ambassador (representative) to India in 1960. She was partly educated in secondary school in India and then attended St. Hugh's College, Oxford University, in England. While there, she studied politics, economics (the production, distribution, and use of goods and services), and philosophy (the study of ideas) and received her bachelor's and master's degrees. From her father she developed a sense of duty to her country, and from her mother, who never spoke of hatred for her husband's killers, she learned forgiveness. She also became influenced by the teachings of Indian leader Mohandas Gandhi (1869–1948), who was a believer in nonviolent civil disobedience. For two years Aung San Suu Kyi worked at the United Nations (U.N.) in New York, New York. In 1972 she married Michael Vaillancourt Aris, a well-known scholar she had met while studying at Oxford. They had two sons and settled in England. Before they were married, Aung San Suu Kyi warned her fiancé that the people of Burma might need her one day and she would have to go back. She served as a visiting scholar at the Center for Southeast Asian Studies, Kyoto University, Japan, from 1985 to 1986 and at the Indian Institute of Advanced Studies in Simla, India, in 1987. After her mother suffered a stroke in 1988, Aung San Suu Kyi returned to Rangoon, Myanmar, to help take care of her. Later that year, there was a revolt against the overly strict administration associated with the militarily led Burma Socialist Party. This revolt started as a student brawl with no real political meaning. However, it was handled badly by the military and spread, becoming an expression of the unhappiness of the people that dated back to the last takeover in 1962. Unfortunately, the new group that took power, called the State Law and Order Restoration Council (SLORC), did not improve conditions in the country. In August 1988 Aung San Suu Kyi gained national recognition as the effective leader of the National League for Democracy (NLD), later opposed to the military-led SLORC. She became the general secretary of the NLD and was a popular and effective speaker in favor of democracy throughout the country. As a result she was placed under house arrest by the SLORC for attempting to split the army, a charge she denied. Although Aung San Suu Kyi was not allowed to run for office in the May 1990 election, her party, the NLD, much to the surprise of the military, won 80 percent of the legislative seats. However, the winning candidates were never permitted to take office. For the first years of her house arrest Aung San Suu Kyi was not allowed to have any visitors, but later her immediate family was allowed to see her. In January 1994 the first visitor outside of her family, U.S. Congressman Bill Richardson, a Democrat from New Mexico, was allowed to meet with her. The United Nations called for her release, as did a number of other national and international groups, including Amnesty International, the worldwide human rights organization. She won many awards for democracy and human rights, including the Sakharov Prize for Freedom of Thought (European Parliament, 1991), the Nobel Peace Prize (1991), and the International Simon Bolívar Prize (1992). Aung San Suu Kyi remained under military watch and house arrest until July 1995. Afterward the government continued to restrict her movement both inside the country and abroad. During Aung San Suu Kyi's first year of freedom, she was only permitted to take short trips in and around her home city of Rangoon and did not travel outside Myanmar. She continued, however, to serve as the vocal leader of the NLD and push for democracy. The military government, meanwhile, closed schools, ignored the healthcare needs of the people, and forced many citizens into slave labor while torturing and imprisoning others. In 1999 Michael Vaillancourt Aris, Aung San Suu Kyi's husband, died in England. He had been denied permission by the Myanmar government to visit his wife during the last year of his life. The government suggested she go to visit him, but she remained at home, fearing that if she left, she would not be allowed to reenter the country. In September 2000 she was again placed under house arrest after attempting to travel to rural areas outside Myanmar to meet with NLD members. In December of that year U.S. president Bill Clinton (1946–) awarded her the Presidential Medal of Freedom, the highest U.S. honor given to a civilian (nonmember of a military, police, or firefighting unit). The U.S. government also continued the ban on new investment in Myanmar and discouraged companies from doing business there as a protest against the military government's treatment of Aung San Suu Kyi and other citizens of Myanmar. In December 2001, in Oslo, Norway, Nobel Prize winners gathered to protest Aung San Suu Kyi's continued detention and signed an appeal to the Myanmar government requesting that she and fifteen hundred other political prisoners be set free. In May 2002 Aung San Suu Kyi was finally released from house arrest. Once again free to move about the country, Aung San Suu Kyi drew large crowds wherever she spoke to her followers about freedom in Myanmar. "The NLD is working for the welfare of everyone in the country, not for NLD alone," she told an audience of supporters a few days after her release. Parenteau, John. Prisoner for Peace: Aung San Suu Kyi and Burma's Struggle for Democracy Greensboro, NC: Morgan Reynolds, 1994. Stewart, Whitney. Aung San Suu Kyi: Fearless Voice of Burma. Minneapolis: Lerner, 1997. Victor, Barbara. The Lady: Aung San Suu Kyi, Nobel Laureate and Burma's Prisoner. Boston: Faber & Faber, 1998.